What Makes Cuenca's Parque Calderon So Special? Wander around Cuenca’s narrow, cobbled streets for any length of time and you’ll see that it is full of charming squares and churches. None, though, is as delightful as Parque Calderon, the city’s central plaza. It's pretty obvious that Parque Calderon is Cuenca’s pride and joy. Sitting right smack dab in the middle of the city’s 500-year-old UNESCO area, it was important enough to deserve eight pines that were brought from Chile and planted by President Luis Cordero. The pines surround a monument to Abdon Calderon, a hero in Ecuador’s battle for independence. Calderon was from Cuenca and died a hero, at the ripe young age of 18. Besides the historical trees and memorial, the park has fountains, a gazebo, beautiful gardens and plenty of park benches. They're shaded by trees and palms. 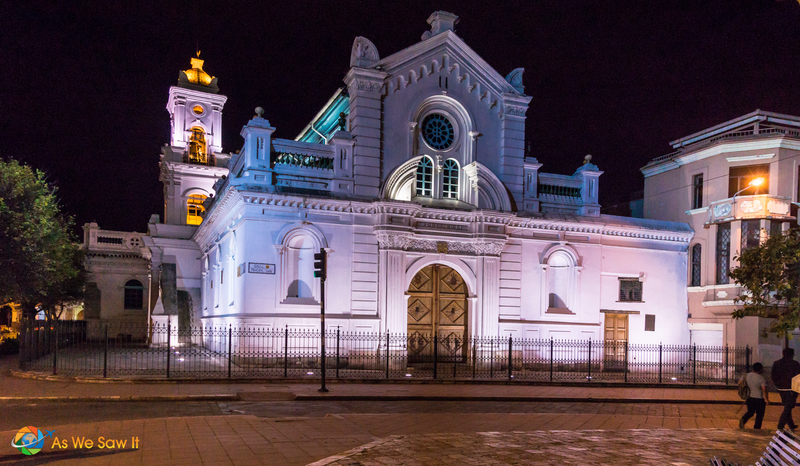 While we lived in Cuenca, we set aside time for a photo walk around the area one evening so we could show what the park is like. I hope you enjoy our video. If you do, please give it a Thumbs Up and consider subscribing to our YouTube channel. Few things can be better than a free sightseeing opportunity, right? 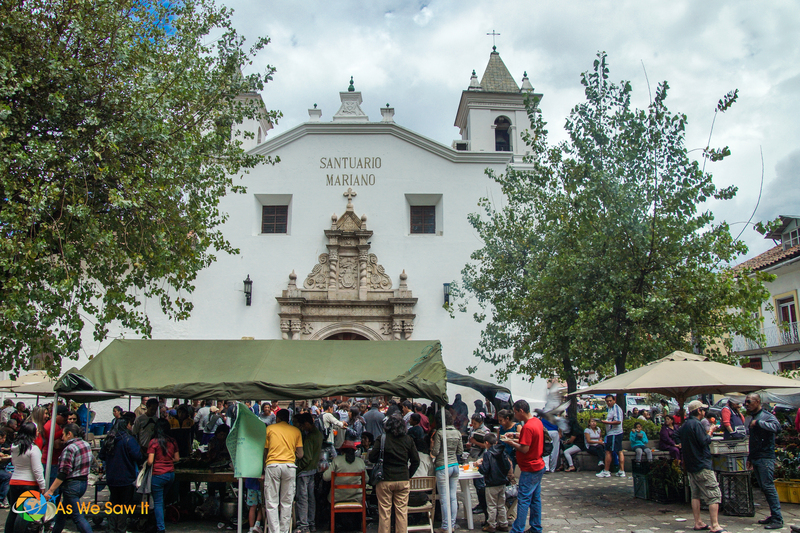 Here is one of the easiest ways to experience authentic Ecuador: Just find a park bench, sit back, listen, and watch … before you know it, the local culture will surround you. 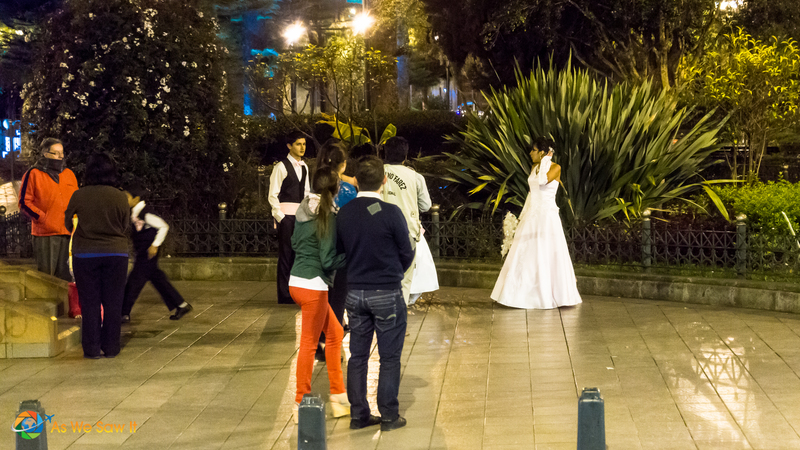 While every town square is a center of local social life, Parque Calderon is the heart of Cuenca itself. During the day you'll see mothers carrying rosy-cheeked babies on their backs … teens will joke with their friends … old men will on a bench reading the newspapers or chat over a game of chess. Or perhaps you'll watch visitors pore over their tourist maps as dogs saunter through with their owners trailing behind on the end of a leash. When you tire of sitting, you'll find markets not far away. There's another slice of Cuencano life to be found there. My favorite flower market ($1.00/bunch!) is just a quick walk around the left side of the New Cathedral. While you may find a street market, see a parade pass by, or hear some music playing from the park’s speakers during the day, Parque Calderon changes after the sun sets. 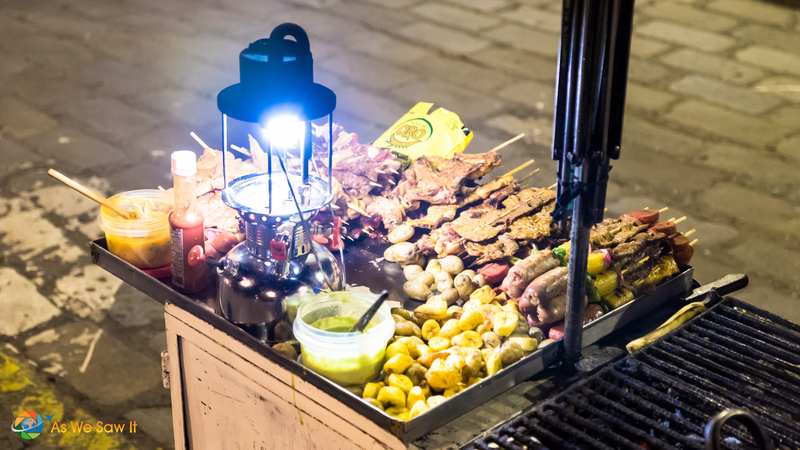 One evening, for example, we found Hare Krishna devotees chanting, teens breakdancing in the gazebo, and street food vendors grilling skewered meat to the light of a gas lantern. We even saw a bridal party posing for photos. Daytime or nighttime, local vendors sell their wares from carts or baskets, and eateries are busy. Gringos will fill the tables in the earlier part of the evening, but locals prefer to dine later. This keeps the restaurants hopping all evening. It also works out well for Parque Calderon's vendors, who you'll always see in front of restaurants. They can set up for the early tourist crowd and still be home in time to enjoy supper with their families. One of the most delightful facets of Parque Calderon is the local people, going about their daily lives in their brilliant traditional apparel. There are a number of indigenous groups in the area, and each has its own style of hat, dress and appearance. 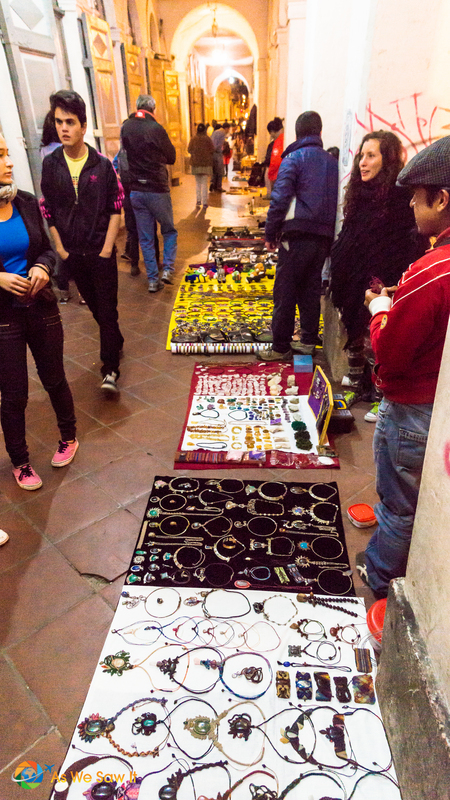 That makes living in Cuenca's El Centro all the more interesting and enjoyable. Well … at least, I think so. As you sit in Parque Calderon, you may find yourself forgetting that half a million people live in the city. 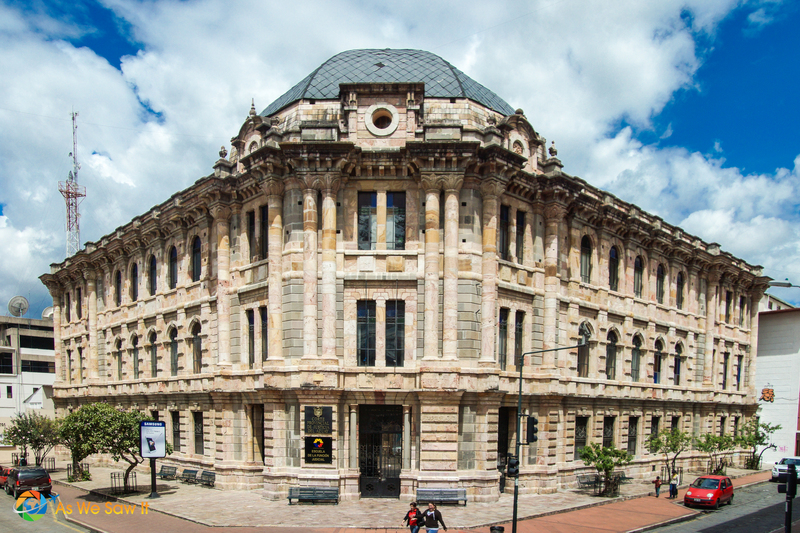 Somehow Cuenca's historic center doesn’t have that urban feel that Guayaquil and Quito have. But even so, there are modern-day businesses everywhere. From your seat in the park, you can see the tourist bureau, a tour bus, the municipal building, numerous restaurants, cafés and ice cream shops, an assortment of local markets, and two cathedrals. Speaking of which, it’s practically impossible to miss those three sky blue domes that top the New Cathedral. You might have seen them already. They are the most-photographed sight in the city. The Old Cathedral has been turned into a museum. Can’t say much about it, because we never managed to be around when it was open. But it's pretty from the outside and exudes Spanish flavor. On our first visit to Parque Calderon we saw people with rainbow-sprinkled ice cream cones, eating them with a spoon. We were surprised by the spoon, but baffled when we realized that it was being sold on the street, yet it wasn’t melting! Come to find out, that’s espumilla, a traditional Ecuadorian treat of whipped meringue, fruit and sugar. 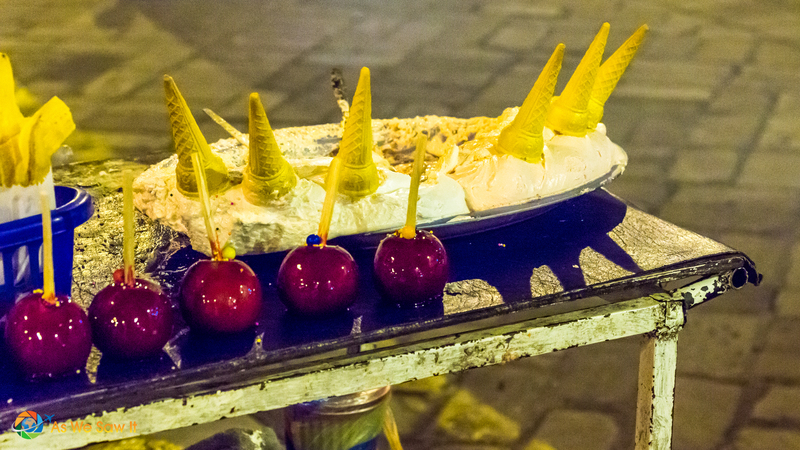 It’s cheap – only 25 cents per cone – and you can buy it from vendors all around the square. Street vendors offer other affordable snacks as well, but if you’re in the mood for a real ice cream cone, hop across the street to the well-known Tutto Freddo. They have a very impressive selection of ice cream flavors and make a killer milk shake. It's Dan's favorite ice cream shop in town. It's good, but my favorite ice cream joint is about 8 blocks away at Plaza San Blas. They sell their own freshly-made ice creams for only a dollar a scoop, and it’s a BIG scoop! Tip: As with most destinations, the prices around touristed Parque Calderon are higher than on the side streets. Walk just a few blocks away from the park and you can enjoy a delicious almuerzo (lunch) for as little as $2.50. Day and night, Parque Calderon has an ever-changing scene. Even if you return again and again, you’ll never get bored. What a special moment you guys captured! Also the street food looks amazing. I love how it’s presented! Thanks, we stopped for coffee and dessert right afterwards! I was baffled by the non-melting “ice cream” too! Such a beautiful square, I loved to just sit and people watch. Not being a fan of sweets, I never tried it. Did you?